SNPlotz is a web tool for users to plot phenotypic effects data from GWAS analysis, along a genome. The plot tool is coupled with the GBrowse to bring up all related genome features (transcripts, genes, QTL, etc) for further data mining on any interesting SNP shown on the plot. Three components in the tool work together to facilitate displaying the location of your SNPs relative to their genome features as well as respective phenotypic association values. A tool to convert a list of SNP names into a GBrowse-ready GFF file for adding tracks in GBrowse. Reference: Zhi-Liang Hu, Rex Fernando, Dorian Garrick and James M Reecy (2010). 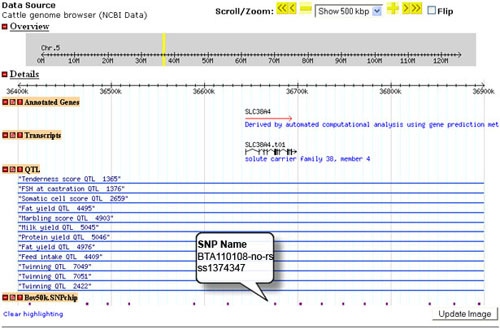 SNPlotz: a generic genome plot tool to aid the SNP association studies. BMC Bioinformatics 2010, 11(Suppl 4):P4.